D_S, that was a mean trick you played on me by posting here. Here, I'll do it again. I'll make it up to you in a bit. You're lucky that I need to spread some reputation around, guy. Last edited by dok; March 15th, 2011 at 11:40 PM. Reason: I guess you're OK. I vote yes to dok & Good Pig's Zombie Hulk. On the right side of the card I observe right off the bat a couple of obvious things about the Zombie Hulk: 1. He hits harder than other zombies. 2. With defense 3, life 3, he doesn't last much longer than other zombies. He is *frail*. He has three interesting powers on the left hand side, which at their most useful are situational and fussy, and at the least useful, well, I never did quite get to resurrect a Zombie Hulk. I'd planned on using a pile of them & zombies against a bunch of Deathstalkers to see if I could pull it off in a "laboratory" environment, but I don't need to do that to cast my vote for the unit. The ZH's "Zombies Rise Again" variant is more theme than anything else, and I'm sure occasionally it will be triggered. Somewhat more practical was Horde Shriek, which works as intended: You don't really get to use it in combat, because there's no bonding when the ZH is engaged. The functionality of one ZH in playtesting became much more restricted when KidScaper started to send scouts past my front lines with the express & single purpose of engaging the ZH. It made it harder, I can tell you that, when I was only using one. Using two gave me some more flexibility. Paralyzing Fear was another fussy ability, but when I could get it to work alongside the zombie's Onslaught, it was a powerful thing. In playtesting, a Zombie army was destroyed by a Nilfheim/Greenscales army, which made sense. Against mixed armies of various types, the zombies tended to swarm Stingers, but more zombies would have been just as effective as the ZH in those battles. Against an army including Venom and Q10, a pair of ZH's swapped OM's back and forth to get one ZH adjacent to Q10 to Paralyzing Fear the big robot as adjacent Zombies onslaughted it to death. Venom, though, didn't have much trouble catching and destroying the Zombie Hulk. They have their place. I suspect in most matches I'd prefer the extra squad of zombies. But against certain matchups, and on certain maps where Onslaught will be particularly difficult, it would be advantageous to have one of these guys to punch something in the face or lower something's defense. It was a real pleasure playtesting the Zombie Hulk and I'm proud to throw a yes vote for it. First off I commend the SoV crew for such a gigantic and noble cause. I was never big on customs but after reviewing C3G and "The Death of Heroscape" I have changed my views. There are some big holes to fill out there. Good Luck. Eremon Vandel is a fun figure to play, especially if you like to play themed armies. One of my favorites while testing was Eremon, Venocs, Aubriens, and Mittens. Even though he doesn't have Frenzy he has a Frenzy like ability that mixes well with the others. After looking at the cards you can't help but make comparisons to Syvarris. Syvarris has the double attack and range of 9, while Eremon has a range of 8 but also the ability to attack several times per turn if you're rolling a hot D20. Eremon also has the benefit of taking away one defense die from all of his targets. Eremon also is a bit stronger than Syvarris with one extra life and an additional defense die. In my games with Eremon he pretty much turned into an end game unit. Rushing him out too early usually spelled a quick death even if he was getting in extra attacks each turn. But at the end, after the armies took heavy losses, I found he really shined here... a bit too much. Even without Fast Draw, with that range of 8, an attack of 4 when on height, and taking away a defense die Eremon proved (to me) to be a bit too good in that end game situation. Run and shoot was the name of the game at that point, and Eremon won out each time. If feel he's very very close though. I think a life drop to 4 (like Syvarris) or a point bump to 110-120 and he'd be perfect. As is, he's just a little too strong for me. *My fellow judges may very well feel differently on Eremon and if that is the case, great. But I would very much encourage a re-work if that is not the case. I would hate to see Eremon never heard from again, after being so close (IMO). I would like to resubmit Priscus, Gladiator Hero, for inclusion in the SoV. I have wavered back and forth for quite a while on Priscus. I like the concept and a lot of things about this unit. I love the smart way the unit is balanced with OMs to make including Spartacus just not quite worth it most of the time. I like the idea of a unit who doesn't have the offensive output of many of the Gladiator Heroes, but makes up for it with the precision (is there a play on his name here?) of his special attack. His special attack is a perfect choice, in my mind. I liked it a bit better as a Shield Pin SA, but the idea of this guy as a precision grappler works well enough and serves a great purpose for the Glads, who can use a little specialized help. Simply, this guy fits in with the Glads extremely well and does nice things for them, without feeling forces, unbalanced, or out of place. On the other hand, I greatly dislike his lowered Taste of Freedom area of affect (from 3 spaces to 1 space) and I don't like that if future ranged Glads come out, they would naturally want to pod (turtle) around Priscus. I wish the power had been limited to Gladiators making adjacent attacks and the aura had remained. The reality is that it's hard to set up an adjacency attack bonus with melee units and I liked that his aura gave him a distinct flavor from most melee cheerleaders. I am glad that his point total dropped--that aura was a nice bonus--but I agree with those that think it didn't quite drop far enough. Of course, I'd rather a price a bit too high over one a bit too low, so I won't hold that against him too much. I also have to admit that I'm not a huge fan of the new sculpt. Maybe mine is just a bad example, but he looks odd to me, squished in the face and a bit elven or something. He does blend in well enough and I know that many players like this sculpt quite a bit. Overall, I feel that he falls a bit flatter than the old Priscus (I think the aura shrink is the biggest reason for this), but he does work well with the Gladiators and opens up the builds for the Capuans in nice ways. I wish we had a perfect sculpt for him and I have some minor reservations or wish-it-could-have-been feelings, but overall I appreciate the solid work that went into designing Priscus. He is a strong addition to the canon. I vote YES to accept Priscus into the Soldiers of Valhalla. Priscus offers a very nice alternate option when building a Gladiator Army. I found that he was usually a better option than Retarius, but will never outclass Crixus. Taste of Freedom makes him a sort of mini-Spartacus, giving adjacent Gladiators an extra attack die, and his Grapple Special Attack I found to be very useful in taking down low defense units. With Priscus as an option there were some very interesting army build considerations to make. Immediately I thought to include both Priscus and Spartacus in the same army (albeit a high point game) in order to double up on the attack bonuses. Add in height to that mix and the Steam Roller now becomes a wrecking machine... in theory. This is where I think a very smart design decision was made for Taste of Freedom. In order for it to work Priscus must have at least one order marker on him, but the same goes for Spartacus as well in order to give his bonuses. What it means is that one of them will have to have at least one numbered order marker on his card, which in turn takes it away from the Capuans and really messes with that strategy. Any concern over Priscus making the Caps too powerful was extinguished very quickly. I found the best builds for Priscus were the ones that did not include Spartacus, but did include an extra squad of Capuans with the point savings. Outside of a Gladiator build I didn't find much use for Priscus. I'm big on themed armies, so that was a big reason why. But also I don't see why I would allow him to eat my order markers when there are better options IMO. I think I would have liked to see Priscus priced at 90pts just to keep him in line with the other non-Sparty Gladiator heroes, but it's not a big deal. As I mentioned above, if you have Priscus in your army, you probably don't have Spartacus, which allows for more Capuans to be included. Definitely not a bad thing. The lure is definitely there to try and double up the attack bonuses, but I think there are too many moving parts to make it work effectively making his current cost pretty much right on target. The model I was very iffy on when I first saw the nomination, I wasn't sure he quite captured the Gladiator feel. I proxied Priscus in my playtesting, but as I started leaning towards a final vote I decide to pick up the figure. After rebasing him, wow, the transition is seamless. The sculpt absolutely works with the rest of the Glads. Availability isn't so great at the moment. A quick check of ABprices.com shows that it's actually crazy low right now. At the time of nomination there were enough to go around (relatively speaking) and I think I have to use that information since this unit has been sitting in a review status for quite some time. Giving it a knock on rarity at this time I feel wouldn't be fair. As for the price, I think the most I saw it for was $3 (and as low as $1.50), which is fair IMO. I went back and forth on Priscus with my vote for a while. I wrestled with wanting more consistency with the other non-Sparty heroes (like the points and normal attack dice, though they all do have an ability that effects defense) and at the same time knowing this is absolutely a solid unit and meshes in with Scape very well. The tipping factor was the figure, which is why, for me, the last step in the process when I am leaning towards a yes or teetering, is to acquire the figure and see how well it fits. As I said above, once rebased you can't tell it's not a Scape figure if you didn't know better. I vote YES to induct Priscus into the SoV. Going into testing of Filthy the Clown's Priscus, I had a sense of familiarity with it, having reviewed an earlier version of it for the SoV. I found that this version played much the same as the previous version, just set at 8, instead of 10. His slightly lower point cost helps gives the Gladiator army even more room for adding more Caps, diversifying or showing up at lower point totals. Taste of Freedom's OM requirement still makes it difficult to stack it with Spartacus' Gladiator Inspiration, keeping the power levels in check, and requiring adjacency keeps him more in line with official Heroscape attack bonuses. It gets a slight boost over the previous version in one notable way, now aiding all friendly Gladiators, instead of just Gladiators you contol. Grapple Special Attack gives the Capuan army a much needed SA, and its 1-die defense penalty helps cut through many commons (especially you-know-whats), and gives him a nice edge when facing a hero. I especially like that he now has a new sculpt, as opposed to being a repaint of a (now hard to get) Capuan, and I like that the name of Priscus' SA was changed to suit the flavor of this new mini (little stuff like that can be big, imo ). I vote YES to induct Filthy the Clown's Priscus into the Soldiers of Valhalla. OK, I have ahd a chance to give Filthy the Clown's Priscus a go around. First, as far as his cost goes, in one-on-one matches with similar costed heroes, Priscus consistently lost. However, rather than make me think this meant he was overcosted, it made me think he is priced about right. His Taste of Freedom power is a big part of his cost and in one-on-one matches it is a wasted power. So, if he was able to beat other 100 point heroes when his "big" ability can't even be used it would have meant he was probably undercosted. In army vs. army match ups, his usefulness came through wonderfully but still created a great need for strategic placement and OM use so he wasn't too easy to use which I think helps keep him in the 100 point price range. As far as playability, I love this guy against a rat screen. Even though he can only attack one at a time, since his Grapple is a SA he has a good chance of taking a rat out without triggering Scatter. 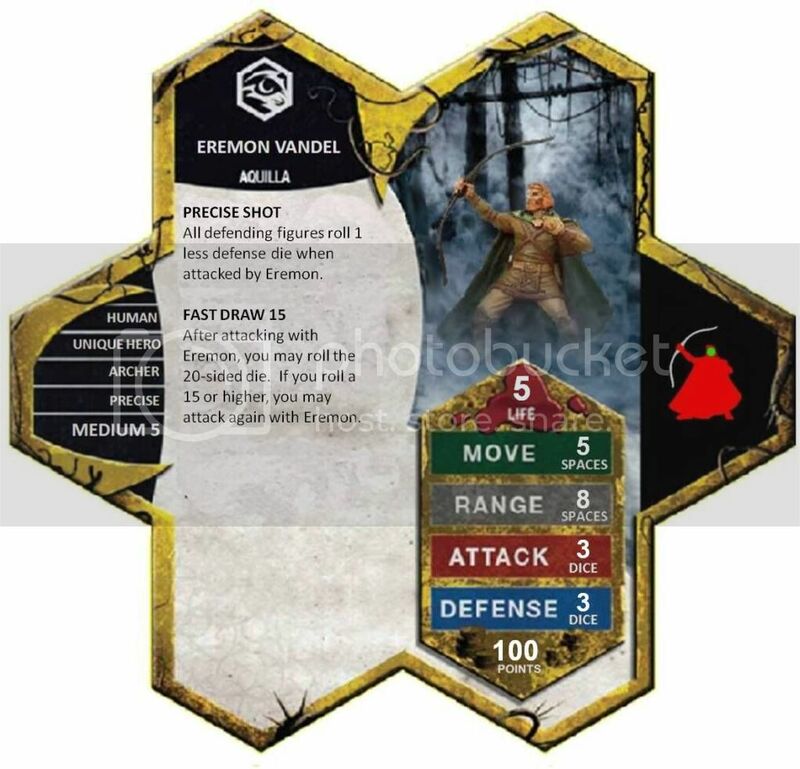 This is especially useful since his Gladiator Class and ToF ability pretty much dictate that he will be in a melee (gladiator) core army for whom rats are a great nemesis. Against other melee core armies he really shined. Both of his abilities were very valuable in these cases. The Capuan Glads benefitted greatly from hus presence. Against range core armies, he fared as well as any other melee hero would be expected to do. With Gladiator Bonding from the Capuans, it was somewhat easy to keep Priscus adjacent to at least 2 Capuans most of the time, especially if it was a smaller point army and you didn't have Spartacus crying for an OM. Taste of Freedom gives the Capuans a great offensive boost but with their 3 defense it was s till a challenge to get them into the action when facing a range heavy army. But, for 100 points for Priscus, this is as it should be. As far as availability, it is shaky. I was able to find 40+- figs available. i would really like to have 50+ available. Since Priscus is a unique hero, though, I am willing to give a little on this (especially since when he was nominated back in MARCH, availability was much better). Usability, fun factor, and costing are all great. He gives other options for a lower costed Gladiator army build. Availability is acceptable. So, I vote YES to induct Priscus into Soldiers of Valhalla. Priscus spat on the ground as the nervous guards passed by. Everything was drowned out by the sudden, roaring applause of the arena crowd. Another gladiator must have met a gruesome death. Priscus' mind drifted back to his village in Germania, where the inhabitants were rumored to be the descendants of savage wolves. Fierce was the battle when Romans stormed his village; he was captured by legionnaires after a horse fell on him, cheating him of his glorious death. It also spared him of having to witness the bloody destruction of his outnumbered friends at the hands of the efficient Roman Legion. Waking to find himself in chains, he was sent to the gladiator pits, where he made a name for himself as a deadly fighter, especially skilled with his bare hands. A nervous prod from the nearest guard brought him back to the present. As the doors opened, the crowd's roar reached new heights. Standing, Priscus curled his hands into fists and strode through the door. Time to kill more Romans. 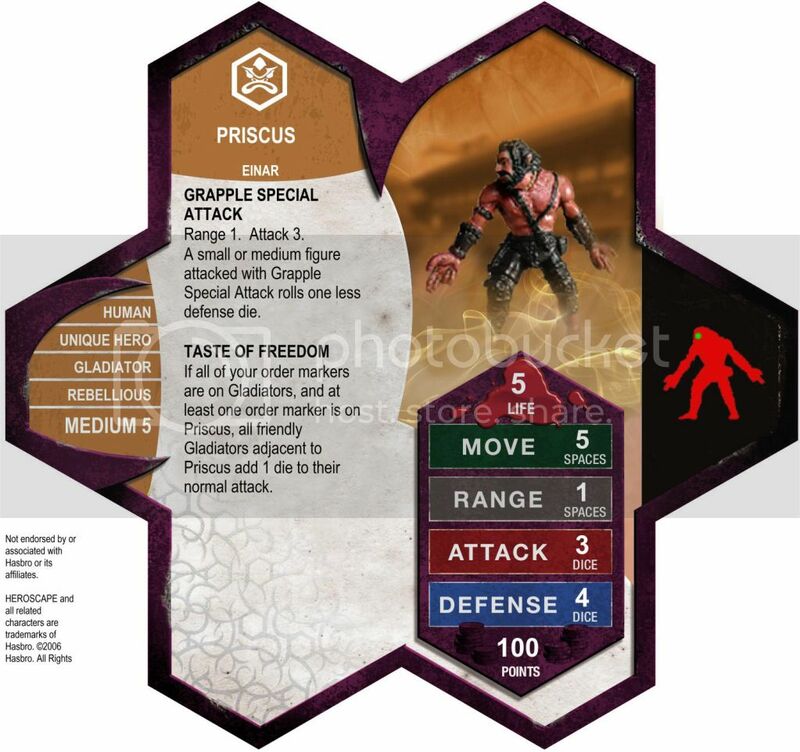 Priscus' points have been reduced from 110 to 100 points, as his abilities have been reduced from his original form (Grapple Special Attack only reduces a small or medium figure's defense by 1, as opposed to the two less defense dice in the original version; Taste of Freedom requires that friendly Gladiators be adjacent to Priscus, rather than within two spaces). He still boosts his fellow gladiators' abilities to strike quickly and take advantage of the assets that their limited numbers contribute to the fray, but he is a bit more balanced, especially with the inclusion of Spartacus. Charging up front and punching a hole through screens that can in turn be exploited by his fellow gladiators. His longevity will be threatened in this scenario, but this becomes moot as the gladiators are able to take advantage of his penetration. Use him as a second wave to go forward and boost frontline gladiators. Send in Crixus first, then follow up with another wave of Capuans, led by Priscus. When Priscus is drafted along with Spartacus, your Gladiators have the offensive potential to punch though just about anything. However, the offset is that you will have less points to draft extra gladiators, which keeps everything balanced. Grapple Special Attack is a unique twist on the unarmed combat that gladiators could potentially expect to face in the arena. Picture the new Priscus as a prisoner from Gaul, forced to fight in the arena. His prowess in unarmed skills are legendary, and his defiance of his Roman overlords inspiring. Taste of Freedom still gives fellow gladiators an attack boost, but they must be adjacent to Priscus; this is similar to the boost that both Khosumet and Finn offer to their respective allies, but with more of a limitation. Priscus fits in the theme of Einar, as a gladiator hero, as well as another gladiator with unique abilities...Namely, his proficiency in unarmed combat. Thanks again for the feedback on the original Priscus, as well as the consideration of v 2.0! Last edited by Filthy the Clown; February 20th, 2012 at 12:50 PM. Reason: Added 1Mmirg's review. Nice work. I vote YES to review Priscus 2.0. Sure, I'll give Priscus another shot. I voted the first time but I like this one more & am looking forward to testing it. I would vote YES to review Priscus, but it looks like he doesn't need it. Priscus by Filthy the Clown has received 4 YES votes to review (1Mmirg, Dad_Scaper, nyys, ZBeeblebrox) and moves on. My experiences with the ZH very much mirror the experiences already recounted by the other judges. I think Horde Shriek was probably the most useful, and most used, ability in the multitude of games I played with this guy. It really helped the slow moving ZoM get into the fray much quicker. Paralyzing Fear took some finessing to get it to work optimally but when you took the time to do it right it worked wonderfully. I like the return for the investment with this ability. If you invest the time and planning, your reward is very gratifying- a great trait for an ability. Zombies Rise Again was best used if you weakened a hero with other units and then brought in a ZH or ZoM to finish it off rather than trying to do the whole job with savage undead units. Of course you ran the risk of getting good attack rolls and killing the hero before your undead could engage and finish it off (probably the only time I ever wanted "average" attack rolls). On the whole, ZRA didn't see a whole lot of use but it was nice to have. I will sum up my opinion with this anecdote. I never had any ZoM before playing the ZH. I got into scape too late to get them at a decent price so I proxied them for my playtests. Since playing the ZH, and the immense fun and challenge that it was, I shelled out the dough for 2 squads of ZoM. Not a whole lot but enough to play the ZH regularly in games now.